A chronic disease, as defined by the U.S. National Center for Health Statistics, is a disease lasting three months or longer. About 40 million Americans are limited in their usual activities due to one or more chronic health conditions. How many people are affected by chronic diseases? Generally incurable and ongoing, chronic diseases affect approximately 133 million Americans, representing more than 40% of the total population of this country.2 By 2020, that number is projected to grow to an estimated 157 million, with 81 million having multiple conditions. About half of all adults have a chronic condition, and approximately 8 percent of children ages 5 to 17 were reported by their parents to have limited activities due to at least one chronic disease or disability. More and more people are living with not just one chronic illness, such as diabetes, heart disease or depression, but with two or more conditions. Almost a third of the population is now living with multiple chronic conditions. In 2009, 7 out of 10 deaths in the U.S. are due to chronic diseases. Heart disease, cancer and stroke account for more than half of all deaths each year. According to the New England Journal of Medicine, people with chronic conditions receive only 56% of recommended preventive health care services. What is the economic impact of chronic diseases? More than 75% of all health care costs are due to chronic conditions.Four of the five most expensive health conditions (based on total health care spending in a given year in the United States) are chronic conditions – heart disease, cancer, mental disorders, and pulmonary conditions. A 2007 study reported that seven chronic diseases – cancer, diabetes, hypertension, stroke, heart disease, pulmonary conditions, and mental illness – have a total impact on the economy of $1.3 trillion annually. By the year 2023, this number is projected to increase to $4.2 trillion in treatment costs and lost economic output. It was about 2 a.m., and like so many nights before, I was wide awake. I felt as if I was at my breaking point. As tears started to dampen my pillow, these words came flooding to my mind, and I wrote them down. Can’t I rest for just a beat? “I’m fine.” I assure adamantly. And maybe end up being someone’s light. I always share happy times and I bet most think I have it all together and I’m like the strongest woman in the world and I have this disease all figured out and tamed but honestly i don’t I just try not to let it completely change me and consume my life but the reality is that if you let it, it will and it does! Here’s a few of my bad days it’s not always peachy n cream! Posted on April 17, 2019 April 18, 2019 Leave a comment on My ugly truth! I’ve never been a fan of needles I mean who is right? Today I under went a epidural injection procedure directly inserted into my lumbar spine, procedure notes below. I must say it was very painful it was the worst pain I’ve felt from an injection, I usually can take pain but this I could not tolerate I cried and broke down cant front I did when i couldn’t feel my leg I panicked thank god for medical marijuana I was vaping on the low in recovery lol! Let’s just say it was intense pain and overwhelming all at the same time for a moment I hated what my life has become I guess reality really hit today but then I realized this is my calling I got through it, and that’s all that matters Yes it was a few mins of pain but for a few months of relief I would take a few moments of pain and my leg going numb for an hour then me being in pain everyday all day and possibly having my legs numb for good if I give up on myself I know the possible risk of everything that I try but I never try anything that others have not done before all in all I have educated myself well enough to know what’s good for my body and what also works and doesn’t work for me I always ask a million questions and I always look up side effects before I approve anything going into my body although the docs are the “experts” this is still my body and I control it! Point is always do your research outsiders will Always have an opinion about trying different methods of pain relief and that’s cool but no one walks in your shoes but you! Be gentle with yourself and take care of you first! PLEASE ALWAYS CONSULT A DOCTOR BEFORE DOING ANY PROCEDURE OR TAKING ANY MEDICATIONS! Posted on April 17, 2019 Leave a comment on Injections for pain! So,I’ve decided to try vaping medical marijuana. Smoking the herb is still a popular consumption method, but this newer method allows you to get those therapeutic cannabinoids without the potentially adverse respiratory effects smoke may cause. Vaping isn’t just a convenient way to obtain the benefits of cannabis without having to inhale smoke it also offers several other benefits. To make sure you experience the benefits of medical marijuana, read on to learn all you can about vaping it! What Is Vaping Medical Marijuana? Vaping is the same thing as vaporizing or vaporization and refers to the consumption method where you inhale weed vapor or aerosol. When you vape, you heat marijuana’s active compounds at low temperatures. There’s no burning or combustion at these low temperatures like there is with smoking. Therefore there’s no smoke. According to researchers, vaping seems to be an ideal and safe approach for using cannabis. Cannabidiol (CBD) oil is one of the most common products to vape medical marijuana, but you can also vape dried marijuana in its raw, bud form, or use other concentrates such as shatters, crumbles or waxes. Vaporizers, many experts believe, is healthier than smoking because it doesn’t release toxins into the respiratory system. There are three main methods of vaping, but all of them involve heating marijuana to the point of vaporization. Conductive heating involves placing CBD oil or dried cannabis onto a surface that is heated through electricity. This surface, known as a “hot place,” is usually either a screen or a piece of solid metal. It’s heated to a certain temperature, and then heat is distributed through the chamber of the device. Convective heating vaporizes weed without it having to touch the heating element directly. Hot air circulates through the device and vaporizes the cannabis. Radiant heating is heat provided through either a light source or electricity. This source gradually increases the temperature until the weed turns into vapor. Some models use a combination of radiant and conductive heat. Those who have respiratory problems or worry about getting them would also benefit from vaping cannabis. Combusting cannabis creates various carcinogens and tar that could lead to lung infections. However, vaping weed doesn’t involve combustion in the way a bong or pipe does. When you vape, much of the vapor you’re inhaling contains cannabinoids, meaning you’re practically getting a lung irritant-free inhale each time. When you smoke a blunt or joint, much of the inhaled smoke includes particles and lung irritants that aren’t cannabinoids. Vaping is much more comfortable on their lungs than smoking. Individuals with cancer who use medical marijuana to treat nausea during their chemotherapy are also thankful for the benefit of a healthier drag. Many people use medical weed to treat their chronic pains and aches, including Crohn’s disease and menstrual cramps. Unlike edibles, which can take hours to feel the full effects, when you vape the medicine, you’ll receive quick relief from your pain. Vaping provides individuals with the fastest way of experiencing relief from pain, which is especially good for individuals who are seeking immediate pain reduction. Pen vaporizers, also referred to as “vape pens,” are small vapes shaped like an electronic cigarette (e-cig) or pen. They’re usually easy to use, discrete and a lot cheaper than stationary or portable vaporizers. Vape pens typically use conduction heating, so it’s essential you understand how to use it properly to ensure you don’t burn or overheat your product. Vape pens also make it easy to consume concentrates on-the-go. Some pens are better than others — the best vape pen will depend on your personal preference and needs. Portable vapes are becoming quite popular as the vaping technology continues developing. If you travel frequently or prefer to vape in various locations, a portable vaporizer is what you need. It’s a little bigger than a vape pen, and you can take it on the go. These types of vapes offer you convenience since you can pack them up in studying and developing it as a drug and bring them with you no matter where you go. They’re typically rechargeable, but you can find flame and butane options. The best portable vapes are made to make cannabis consumption stealthier and healthier. Vapor doesn’t harm your health, like the carcinogens and tars you get from marijuana smoke. Plus, the smell of vapes doesn’t spread as far or linger as long as smoke. These are typically “stay at home” vapes you plug in. While they’re not portable, they generally provide you with a higher vapor quality through the convection heating source. They also provide many more features. For example, there are balloon attachments you can get for stationary vapes that reduce the amount of vapor that is lost. After you remove the bag containing the vapor from the main unit, you use a mouthpiece to inhale the vapor. They usually come with more robust heating systems and larger bowls, making vaping herbs a fulfilling and relaxing experience. This type of vaporizer uses a bag that can be attached and removed from the main unit, and helps reduce the amount of vapor that is lost. When the bag containing the vapor is detached, the user inserts the mouthpiece to inhale the vapor. The bag can be passed among multiple users, much like a bong or a joint. Be careful when using this type, however, because sharing medical marijuana — and, in some instances, recreational cannabis — is against the law in many states. Direct draw models have a mouthpiece attached to the heating unit that allows vapor to flow directly to users. Some have a permanently attached mouthpiece while others have a glass stem that can be removed. Also known as “whip” vaporizers, these use a range of delivery systems that involve pumps or fans. They’re usually about three feet long and made of silicone. There’s a mouthpiece on one end connected to a glass tube that holds the marijuana. The best stationary vapes allow you to use marijuana efficiently. You’ll likely find you’re using less cannabis to experience the effects. Desktop vaporizers can eventually pay for themselves. Vaping might look easy, but it requires some research and practice. Before you start vaping, there are some things you should know. Into the mouth, then your lungs. Just into your mouth and throat. It’s probably best if you start with the third option and then move on to the other two once you’re comfortable using your vape. You might feel an itchy or pinchy sensation after you take a slow and smooth drag. This is normal and should go away. Exhaling will feel different than smoking. You don’t get as harsh of a burn sensation, but you might still cough and feel the constricted, pinching feeling in your throat. Just take it easy and slow down. An enjoyable aspect of vaporizing is you can exhale through your nose, allowing you to pick up the cannabis flavors. How you use your vape will depend on what material you’re vaping. For instance, if you’re vaping dried herb, you’ll need to break down the cannabis with an herb grinder so that it fills the convective heating compartment or covers the heating surface. This will make it so you receive the most benefit from the herb you’re vaping. When using wax, CBD oil or another concentrate, you’ll only need a tiny amount to experience the effect you desire. The optimal temperature for vaporizing marijuana is said to be 338 Fahrenheit, though concentrates will typically vaporize at about 285 Fahrenheit. When you smoke a joint, it burns at temperatures as high as 2,000 Fahrenheit or sometimes higher. There will usually be a digital temperature control feature on vaporizers that allow you to set your temperature. Heightening the anti-inflammatory and relaxing effects of cannabidiol when vaporizing CBD in larger amounts. Reducing the severity and frequency of seizures and treat chronic pain conditions. Offering a fast-acting migraine and nausea relief. Treating mood, psychological and cognitive disorders, including PTSD and severe anxiety, especially when vaporizing CBD oil with small amounts of THC. Alleviating everyday pains and aches to help you to sleep better. Improving heart health by reducing cholesterol and hypertension. Relieving spasticity and neuropathic pain syndromes different pathologies cause. For most people, weed’s therapeutic qualities are worth it, while some don’t react well to cannabis. So, you’ll want to be sure you work closely with a qualified cannabis doctor and dispensary if you’re just getting started. Trying different marijuana medicines under a doctor’s supervision will help you find the right ingestion method and strain for your lifestyle. Vaporizers are becoming popular rapidly in the medical cannabis community, mostly because they offer people a safer way of ingesting marijuana than by smoking it. More studies may conclude how marijuana smoke can affect the respiratory system. But, because vaping devices take this concern away, it’s a big advantage in the medical weed market. Using cannabis correctly has many health advantages. You can avoid some of the health effects of smoking and inhaling tar and carcinogens if cannabis is heated to where the cannabinoids release without destroying/igniting the material. And, this is what vaping does. University of Albany researchers conducted a study that found vaporizers are looking promising as a “harm reduction technique.” What this means is a vaporizer may reduce respiratory system damage that smoking marijuana causes. GW Pharmaceuticals conducted another study that found vaporizers could help protect lungs from irritants. When you burn any organic material, it creates a mix of different chemicals in the smoke. Free radicals can come from burning. These produce Polycyclic Aromatic Hydrocarbons (PAH). PAH can cause cancer and are toxic. Vaporizers help reduce PAH dramatically. CBD has therapeutic and medical promise, and companies are investing in studying and developing it as a drug. But, vaping CBD’s health benefits are really due to it being a non-addictive, safe alternative medicine. CBD is a cannabinoid produced by hemp and cannabis plants. For medicinal and therapeutic users, it very well may be the most important cannabis compound. Both anecdotal evidence and studies show CBD is effective for treating various conditions and their symptoms. It doesn’t have any psychoactive effects like THC. Instead, CBD oil provides strong medicinal effects and can be beneficial to your health in a variety of ways. The healing powers of CBD ultimately stem from its well-supported anti-inflammatory properties. By reducing muscle and nerve inflammation, CBD helps treat many symptoms and diseases caused or worsened by inflammation. There are also studies showing CBD can shrink tumors and kill cancer cells. Here are some tips you can follow when just learning how to vape medical marijuana. Use it in a comfortable space: When trying medical marijuana for the first time, you don’t want to panic. Worrying can trigger anxiety and disrupt your experience. Therefore, create a comfortable space for yourself. Listen to music or bring a friend — preferably one who uses cannabis or has experience with it, particularly with vaping. There are side effects of vaping medical marijuana, and being your first time, expect to experience them. So, ensure you’re comfortable. Choose a vaporizer carefully: Find the appropriate vaporizer for the type of cannabis you choose. For instance, dry herb vaporizers are usually made specifically for oils, dry herbs and concentrate. Ensure you’re using the proper cartridge/tank if you’ve purchased a 3-in-1 vape model. Choose your strain: If you’re looking for a cerebral high offering a boost of creativity, a sativa-dominant strain is best. An indica strain will make you feel relaxed and maybe even sleepy. Hybrids combine these effects. When you go to the dispensary, speak with a staff member and let them know your symptoms or what effects you’re looking for. They’ll help you find a good strain that matches your needs. Start slowly with dosing: Start off with one or two drags at first. Being a first-timer, it shouldn’t take more than this to experience marijuana’s effects. Give it a half hour and if you don’t feel anything or the effects are extremely slight, take another drag or two. It’s best to work your way up in dosage, rather than the other way around. Preheat your vape: Be sure to give your vaporizer time to reach its ideal temperature for the best results. Just like you would preheat an oven to cook or bake, you want to preheat your vaporizer. Use steady and shallow breaths:Vaping is different than smoking a joint or a bong. When vaping, you don’t want to draw in fast, deep breaths. Instead, take steady, shallow breaths, ensuring you draw in the vapor in your mouth and lungs. Properly maintain and clean your vaping apparatus: Follow the device’s instruction manual to clean and maintain your vape properly. By properly cleaning and maintaining your vape, you help to ensure it runs properly and provides you with smooth and clean vapor. 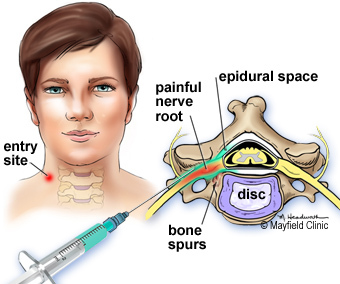 An epidural steroid injection (ESI) is a minimally invasive procedure that can help relieve neck, arm, back, and leg pain caused by inflamed spinal nerves due to spinal stenosis or disc herniation. Medicines are delivered to the epidural space, which is a fat-filled area between the bone and the protective sac of the spinal nerves. Pain relief may last for several days or even years. The goal is to reduce pain so that you may resume normal activities and a physical therapy program. A steroid injection includes both a corticosteroid (e.g., triamcinolone, methyl-prednisolone, dexamethasone) and an anesthetic numbing agent (e.g., lidocaine or bupivacaine). 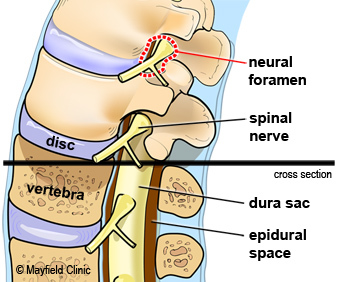 The drugs are delivered into the epidural space of the spine, which is the area between the bony vertebra and the protective dura sac surrounding the spinal nerves and cord (Fig. 1). Figure 1. Side view of the spine. The epidural space is a fat-filled area that lies between the bony vertebra and the dura sac, which surrounds and protects the spinal cord and nerve roots. Corticosteroid injections can reduce inflammation and can be effective when delivered directly into the painful area. Unfortunately, the injection does not make a herniated disc smaller; it only works on the spinal nerves by flushing away the proteins that cause swelling. The pain relief can last from days to years, allowing your spinal condition to improve with physical therapy and an exercise program. Spondylolisthesis: A weakness or fracture between the upper and lower facets of a vertebra. If the vertebra slips forward, it can compress the nerve roots causing pain. Degenerative disc: A breakdown or aging of the intervertebral disc causing collapse of the disc space, tears in the annulus, and growth of bone spurs. ESI has proven helpful for some patients in the treatment of painful inflammatory conditions. ESI can also help determine whether surgery might be beneficial for pain associated with a herniated disc. When symptoms interfere with rehabilitative exercises, epidurals can ease the pain enough so that patients can continue their physical therapy. ESI should NOT be performed on people who have an infection or have bleeding problems. The injection may slightly elevate the blood sugar levels in patients with diabetes. It may also temporarily elevate blood pressure and eye pressure for patients with glaucoma. You should discuss this with your physician. If you think you may be pregnant, tell the doctor. Fluoroscopy x- rays may be harmful to the baby. Physicians who perform epidural steroid injections include physiatrists (PM&R), radiologists, anesthesiologists, neurologists, and surgeons. The doctor who will perform the procedure reviews your medical history and previous imaging studies to plan the best approach for the injections. Be prepared to ask any questions at this appointment. Patients who take take blood thinning medication (Coumadin, Plavix, etc.) may need to stop taking it several days before the ESI. Discuss any medications with your doctors, including the one who prescribed the medication and the doctor who will perform the injection. The procedure is usually performed in an outpatient center using x-ray fluoroscopy. Make arrangements to have someone drive you to and from the center the day of the injection. The goal is to inject the medication as close to the painful nerve as possible. The type of injection depends on your condition and if you have metal rods or screws from previous surgery. The doctor will decide which type is likely to produce the best results. The patient lies on an x-ray table. Local anesthetic is used to numb the treatment area so discomfort is minimal throughout the procedure. The patient remains awake and aware during the injection to provide feedback to the physician. A low dose oral sedative, such as Valium or Versed, may be offered depending on the center. With the aid of an x-ray fluoroscope, the doctor directs a hollow needle through the skin and between the bony vertebrae into the epidural space. Fluoroscopy allows the doctor to watch the needle in real-time on the x-ray monitor, ensuring that the needle goes to the desired location. Some discomfort occurs, but patients more commonly feel pressure than pain. Cervical ESI (neck). The needle entry site is from the side of neck to reach the neural foramen, just above the opening for the nerve root and outside the epidural space (Fig. 2). Contrast dye is injected to confirm where the medication will flow. Figure 2. An ESI injection in the cervical spine for neck or arm pain. The needle is inserted from the side of the neck to reach the neural foramen to deliver the steroid medication (green) where the inflamed nerve root exits the spine. Lumbar ESI (low back). The needle entry site is slightly off midline of the back to reach the nerve canal (Fig. 3). Contrast dye is injected to confirm where the medication will flow. Figure 3. An ESI injection in the lumbar spine for leg or low back pain. 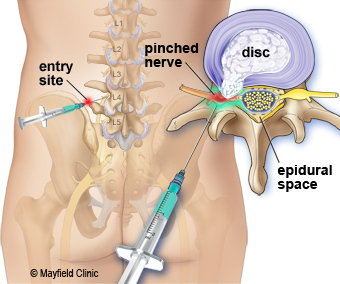 The needle is inserted from the back on the affected side to reach the epidural space to deliver steroid medication (green) to the inflamed nerve root. Caudal ESI (tailbone). The needle is placed in the sacral hiatus above the tailbone to reach the lowest spinal nerves. Contrast dye is injected to confirm where the medication will flow. When the needle is correctly positioned, the anesthetic and corticosteroid medications are injected into the epidural space around the nerve roots. The needle is then re­moved. Depending on your pain location, the procedure may be repeated for left and right sides. One or several spinal levels may be injected. Most patients can walk around immediately after the procedure. After being monitored for a short time, you usually can leave the center. Rarely temporary leg weakness or numbness can occur; therefore someone should drive you home. You may want to record your levels of pain during the next couple of weeks in a diary. You may notice a slight increase in pain, numbness, or weakness as the numbing medicine wears off and before the corticosteroid starts to take effect. Patients should schedule a follow-up appointment with the referring or treating physician after the procedure to document the efficacy and address any concerns the patient may have for future treatments and expectations. Many patients experience some pain relief benefits from ESI [1,2]. For those who experience only mild pain relief, one to two more injections may be performed, usually in 1-4 week intervals, to achieve full effect. Duration of pain relief varies, lasting for weeks or years. Injections are done in conjunction with a physical therapyand/or home exercise program to strengthen the back muscles and prevent future pain episodes. Medications I have taken since diagnosed! When I was first diagnosed with AS I had no clue what it was or how serious it was until I started doing my own research, I complied with all the medications that were suggested because I was not educated on the disease and i was hopeful they would work and help with my symptoms but they did not! Every single one of these medications failed me. I’m now only on medical marijuana and lyrica which has been helping but it took a while to get here. I took myself off of all the rest of the medications because I feel like they were causing more damage than good. Please always look up any medications prescribed to you and do your own research! Posted on April 15, 2019 Leave a comment on Medications I have taken since diagnosed!